Rinse apples under cool running water and drain. Cut into small cubes. Sprinkle apples with lemon juice to prevent discoloration. Combine apples, drained fruit cocktail, celery, raisins, mayonnaise, and nutmeg (nutmeg is optional). Mix lightly to combine. Cover and refrigerate until ready to serve. For best results, serve salad the same day that it is prepared. CCP: Refrigerate fruit for service at 41 degrees F or lower. Portion with #8 scoop (½ cup) per serving. Each portion provides ½ cup of fruit. CCP: Hold under refrigeration (41 degrees F or lower) until ready for service. Check temperature every 30 minutes. Cover, label, and date any leftovers . Use USDA Foods or Department of Defense (DoD) products when available. 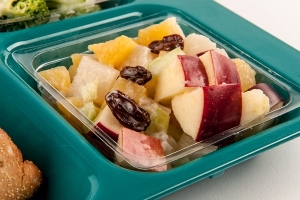 Refer to USDA FNS Food Buying Guide for School Meal Programs for quantities to purchase if different varieties of fruit are used (such as canned). "Culinary Techniques for Healthy School Meals: Preparing Fruits" provides seasoning and serving ideas for fruits.